A signed, limited edition, digital print (100 in total) taken from an original acrylic artwork. 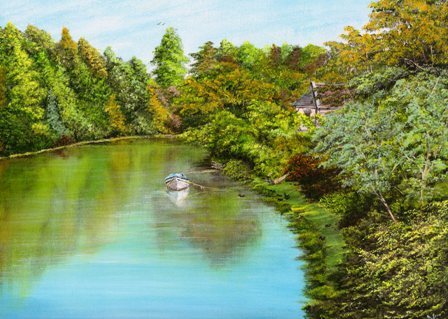 Showing the river Coquet in Warkworth in Northumberland, as Autum begins and the trees start to change colour, Little ducks sleep on the bankside and swim in the river near the small boat moored there. A lovely cottage is almost hidden by the trees.